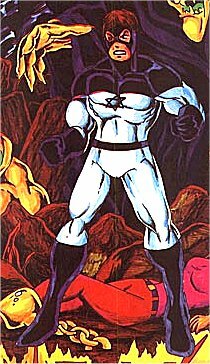 Powers/Abilities: Sabraman can shoot radioactive rays from his eyes (strong enough to penetrate 15 cm thick titanium), can fly fast enough to cross an ocean in a split-second, and surround himself with a magnetic force field that prevents anyone from attacking him. He is strong enough to bend metal with ease, and can teleport. History: Sabraman was given his super powers by the superagency of Israel. In 1975 that agency implanted atomic rod in the chests of 28 super agents, giving each one powers far beyond normal men. The 18th agent to undergo the procedure was Dan Bar On, a former policeman who was a holocaust survivor and had fought in the 1956 war, the Six Day War and the Yom Kipur War of 1973. When they implanted the rod in him, the vast powers of the rod were unleashed and there was an explosion which destroyed the entire laboratory. Fifteen people were killed in that explosion, but Bar-On himself survived with the rod still inside him. It was later found that he had developed powers greater than any of his counterparts. Dubbed Sabraman, he fought villains such as the Nazi scientist Dr.Mengele, and became a hero of Israel. Comments: Created by Uri Fink when the artist was only 15, back in 1978. The character was not a massive success, but did manage to get published for a while in the Israeli English-language newspaper, "The Jerusalem Post", as well as his own, short-lived, comic. Analogues: Dan Bar-On has a counterpart in the alternate universe of Profil 107. I was first tipped off to the existence of this character by the Israeli Society for Science Fiction and Fantasy site - thanks to them for being willing to help me find out more about him. And thanks to Eli Eshed for providing images and additional information on him. Thanks to Karl Gillespie for informing me of Sabraman's powers, and to Trond Haram Klykken for informing me of his enemy Dr.Mengele. 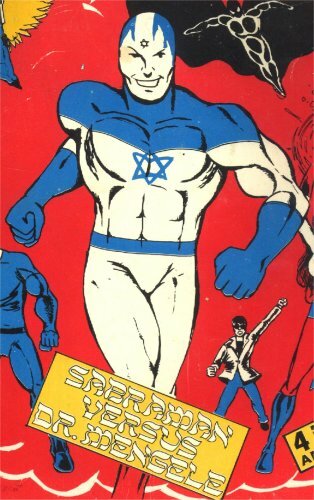 Sabra, Marvel comics' Israeli superhero. Dan Bar-On, his counterpart in the Profil 107 universe.